If you are in a bind and don't have time to wrap gifts this year our youth are ready to help you out! 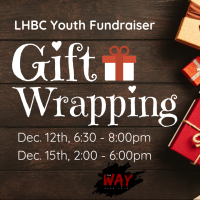 Wednesday, December 12th & Saturday, December 15th our youth will be at the ready to wrap and beautify those gifts you thoughtfully picked out for your loved ones! Give yourself some much needed relaxation time and show our youth some love by bringing your gifts to Lincoln Hills to be wrapped this Christmas season.